While in London in 1786, Jefferson purchased his first achromatic telescope from Peter and John Dollond, who continued to make the instrument perfected by their father, John Dollond (1706-1761). 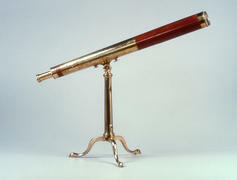 This refracting telescope, with "three object glasses," cost �10-10.1 Jefferson acquired a second Dollond telescope for an unknown price in 1793.2 Both instruments survive, although it has not been determined which was purchased first. Although he often expressed a desire for a more powerful telescope, Jefferson apparently never acquired one capable of viewing the eclipses of Jupiter's satellites, a requisite for the other common method of determining longitude. In the 1820s Jefferson lent his "best" telescope to Hermann B��e, then engaged in mapping Virginia. When attempting to recover it, he wrote that he intended to give it to the University of Virginia.5 The telescope illustrated here descended through the family of Thomas Jefferson Randolph and bears the inscription "Thomas Jefferson Monticello" on the band near the eyepiece. Artist/Maker Peter Dollond and John Dollond, Jr.
Silvio Bedini, Statesman of Science, 344-46. Thomas Jefferson to William Short, 3 January 1826, Massachusetts Historical Society. A second pedestal achromatic telescope made by Peter and John Dolland that is owned by the University of Virginia may have been deposited there according to Jefferson's intention. It has been on loan to the Thomas Jefferson Foundation since 1949. 18 January 1778, James A. Bear, Jr., Jefferson's Memorandum Books. Thomas Jefferson to David Rittenhouse, 19 July 1778, Julian Boyd, The Papers of Thomas Jefferson, 2:202. 15 April 1786, James A. Bear, Jr., Jefferson's Memorandum Books.